In today’s episode, we will resume our discussion about record companies in the Arab world at the beginning of the 20th century. We had ended our discussion about the evolution of Baidaphon … well, not completely. But here is our question to you Professor: what was the nature of the relationship between record companies and music professionals, i.e. musicians and singers? Was it a monopoly contract? Was it a contract by piece? Was it on a fee basis? There were monopoly contracts between the singers and the companies, of course. For example, Sheikh Yūsuf al-Manyalāwī only recorded with Sama‘ al-Mulūk first, i.e. Bekka, then with Gramophone. The muṭrib signed an agreement with the company preventing him from recording with any other company. Other singers were more like “mercenaries”, such as ‘Abd al-Ḥayy Ḥilmī and Sayyid al-Ṣaftī who recorded with all the companies at hand. This of course led to an unbelievable number of their records: more than 250 discs for ‘Abd al-Ḥayy Ḥilmī (counting all the discs he recorded), and 250, 300 or even 350 for Sayyid al-Ṣaftī… We need to count them to confirm their number. So, the point is there was Baidaphon, the Lebanese record company, and on the other hand the foreign companies that were recording fewer discs because of the troubled times and security issues during World War 1 (1914-1918). 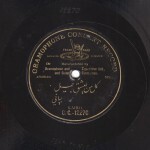 The only foreign record company –almost– that continued to make some recordings and to commercialize them was Gramophone, despite the problems between its German branch and its British branch: some Arabic matrixes were stored in Hanover in Germany and the Germans decided, during the war, to keep them and to commercialize them under a new brand-name “Polyphon”, a record company that split from the mother company Gramophone. And it remained separate after the war. After the war, Polyphon remained separate from Gramophone, but gave it the old matrixes back, and these records were banned. Yet, record amateurs are proud of these strange Polyphon records of Yūsuf al-Manyalāwī or ‘Abd al-Ḥayy Ḥilmī, that are in fact Gramophone records carrying the German label (after the Germans stole them and commercialized them under their brand-name). The point is that during World War 1, only one local company started recording debutant performers: Egyptian company managed by Mr. Meshian of Armenian origin, as his name and his accent show. He could not pronounce the “ḥ” (ḥā) or the “ ‘ “ (‘ayn) while presenting the singers in the beginning of the record. Let us listen to him a little. 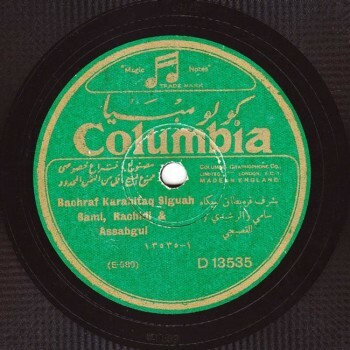 Mr. Meshian is the one who first recorded Sayyid Darwīsh. Of course, we can listen to some excerpts of Sayyid Darwīsh’s recordings with Meshian, as well as those of debutant ‘ālima or muṭriba. There are also recordings of plays. I think there is a Fatḥiyya Aḥmad melody no other company recorded. 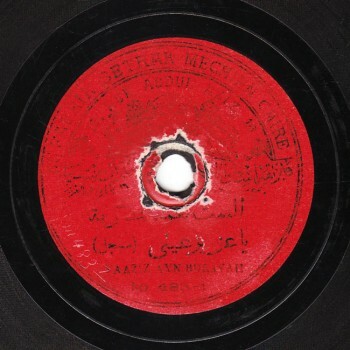 Even Sheikh Abū al-‘Ilā Muḥammad recorded with Meshian in a rare disc we may listen to in another episode: a strange and bizarre version of his qaṣīda “Wa-ḥaqqika anta al-muna w-al-ṭalab” to the bayyātī. World War 1 ended, and Mr. Meshian either stopped recording or made fewer recordings. …so they would notice the big difference, as well as the quality recordings had reached. A good example is the excellent recording of Sheikh Yūsuf al-Manyalāwī recorded by British sound engineer Arthur Clarke in 1910. 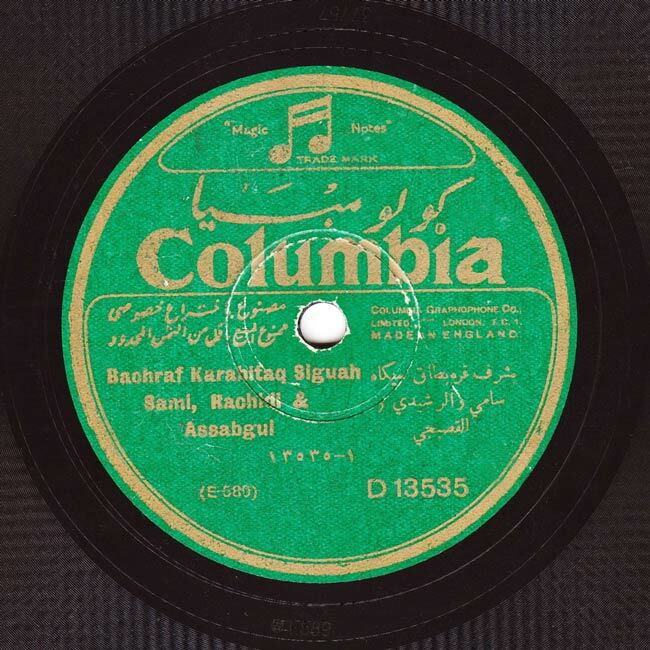 When World War 1 ended, international record companies returned to the Middle-East. In the beginning, their operation was limited to Lebanon and Egypt but soon extended to the other countries. There are even recordings made in the Gulf, including Kuwait, Bahrain, and many in Iraq. 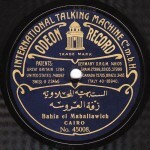 Starting the first decades of the 20th century, their operation reached the Arab Maghreb whose recordings increased visibly after World War 1. French company Pathé also came to the Middle-East, which in my opinion was a bad decision. The journey of Pathé in the Midle-East is similar to the story of Apple v/s Windows in the Middle-East today. The American and European markets are divided between Windows and Macintosh, whereas the Middle-East market almost exclusively uses Windows: using Mac is exceptional. Now concerning Pathé: the technology of the needle and its position on the disc was horizontal instead of being vertical, for example…. You surely know more about this than me. The point is that Pathé’s technology was different from Gramophone’s and all the other companies’. Consequently, the consumers needed not only to get specific needles but also a gramophone/phonograph head compatible with the Pathé discs. Would Egyptian, Lebanese, Syrian, or Iraqi listeners logically go and buy a device for French discs that only reached them after World War 1? While the other companies had been there long before and people already owned the machines and the ordinary needles? 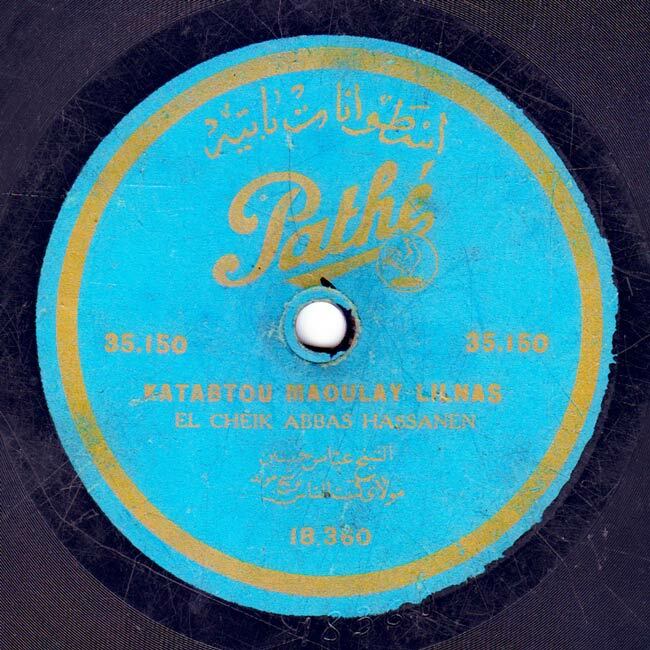 Thus, Pathé almost failed in commercializing their records in the Middle-East even though they claimed –and maybe, as a French citizen, I will concur out of patriotic sentiment– that their discs’ quality was better than Gramophone’s. Still, an Arab consumer could not understand this and tried in most cases to play the Pathé discs on the same Gramophone device with the same Gramophone needle. Of course, the sound that came out was closer to static than to singing, unfortunately. There was not such a big difference in the quality… I’m sorry. (♩) (‘Abbās Ḥasanayn: “Mawlāya katabta raḥmat al-nāsi ‘alēk”). So many companies came out of nowhere, including Homochord, Perfectophone, and Favorite that appeared with Bekka in the beginning… but both went down very fast. … in the late 1920’s. This one came with electricity… Let us talk about electricity. They say it started in 1926, and reached the Middle-East before long. I think electricity started in 1925 or 1926 in Europe. While the first electrical recordings in the Middle-East were made in 1927. In 1927, static-free records arrived with Columbia. Would you play for us something out of a static-free record? Strangely, the sound quality of a new electric record is excellent. Unfortunately, with time, electric records melt and wear out very fast. Thus, one can still listen to a used ordinary record, while this is impossible with used electric records that produce a very disturbing sound. Let us listen to a few static-free records. Mr. Meshian came back and made electric records. Maḥmūd Ṣubḥī… Of course he meant Sheikh Maḥmūd Ṣubḥ, but pronounced it Maḥmūd Ṣubḥī. Mr. Meshian was older now, and his voice had changed. He only came back with electrical recording… after a long absence, right? 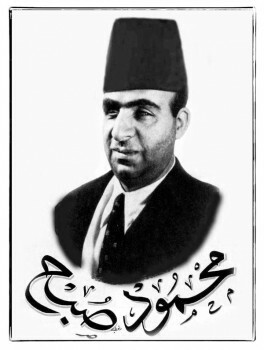 Indeed, it seems Mr. Meshian disappeared for a long time before joining the market again with electric records in 1927. The beginning of the end came as a result of a combination of factors. First: the financial crisis that started in New York on black Thursday of October 1929 and expanded worldwide, and reached the orient starting 1930. Consequently, Egypt’s economy that depended essentially on cotton was hardly hit, and people refrained from buying luxury items including records. This was not the only factor, as the early 1930’s also marked the beginning of the radio in the Middle-East. Second: In 1927, “The Jazz Singer” movie kicked off the talking movies era in America, followed by Egypt in 1932. Movies allow listeners to see the singer, and moreover, have a story… maybe this is why people flocked towards movie theatres and stopped, or rather refrained from buying records. So, records’ sales decreased noticeably because of the radio, because of cinema, and as a result of the financial crisis. The early 1930’s were, to a certain extent, the beginning of the end of the Arabic record’s golden age. Concerning talking movies, note that Arabic movies were musical movies rather than talking movies. Musical movies… like musical plays, you mean? So, the cinema industry in those days is like the Internet today… It wiped out records’ sales the same as the Internet wiped out CDs’ sales. Strange things happened in relation to movies: singers sometimes made another recording of a piece they had sung in a movie, for example. Another example is the rare case that happened with Umm Kulthūm: In the movie “Wadād”, “ ‘Ala balad el-maḥbūb” was sung by ‘Abduh al Sarūjī, yet Umm Kulthūm re-recorded it herself because of the success it gained with the movie. That is one of the strange anecdotes concerning discs. Let us listen to this sample to end today’s episode of “Min al-tārīkh”, part 2 of our discussion about record companies in the Arab World. And we will meet again in a new episode of “Min al-tārīkh”.